Below freezing temperatures and severe wind chills is normal Wisconsin weather during the winter months. The low temperatures can make you at risk of freezing pipes and laterals. While we can’t control the weather, we can take steps to prevent a majority of freezing issues. Look for typical problem areas: Check unheated basements regularly. Look for pipes near broken or open windows. Look at pipes near foundation walls or near cracks in the foundation. Identify exposed pipes outside your home. Freezing pipes can be detected by: Unusually cold water temps (less than 35° F). Unusually low water flow/pressure. Discolored water at fixtures. Sputtering sound when first running water. Frozen pipes can be thawed: It is safest to use hot air from a hair dryer or exhaust from a vacuum cleaner. Heat tape can also be used but be careful to follow manufacturer’s instructions. Never thaw with an open flame. Other prevention tips include: Shutting off and draining outside faucets. Run small amounts of water from the highest faucet in the building. Insulate walls near exposed piping. Repair cold air leaks and reduce drafts. Be prepared for the worst: If pipes do freeze, be careful of cracked pipes that can spray water or bust. Ensure basement drains are clear. Know where the main shut-off valve is located to shut of water. 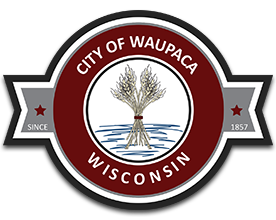 If you need additional information or assistance, please contact the City of Waupaca Water Utility at: (715) 258-4423.